PM Modi asked industry to take risks and make investments, CII president Sumit Mazumder said after the meeting. 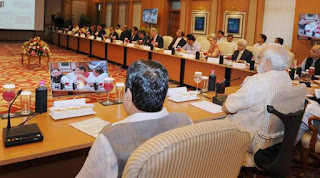 Prime Minister Narendra Modi today met top CEOs, bankers, economists and ministers to discuss ways to bolster the economy amid global slowdown. The meeting, with the agenda ‘Recent Global Events: Opportunities for India’, was held at a time when global markets are in turmoil caused by a slowing Chinese economy, devaluation of the yuan and concerns surrounding the prospect of a US rate hike. Modi asked industry to take risks and make investments, CII president Sumit Mazumder said after the meeting. Finance Minister Arun Jaitley, Reserve Bank Governor Raghuram Rajan as well as Road Transport and Highway Minister Nitin Gadkari, Power Minister Piyush Goyal and Oil Minister Dharmendra Pradhan joined the brainstorming at Prime Minister’s official residence here. “A wide-ranging discussion is expected on the impact of recent economic events, and how best India can take advantage of them,” an official statement had said about the meeting yesterday. Reliance Industries Chairman Mukesh Ambani, Tata Group head Cyrus P Mistry, Aditya Birla Group head Kumar Mangalam Birla, Sunil Bharti Mittal of Bharti Airtel and ITC chief Y C Deveshwar were among the industry leaders who attended the meeting. State-owned gas utility GAIL India Chairman B C Tripathi and BHEL chief B Prasad Rao too were present at the meeting which was also attended by ICICI Bank CEO Chanda Kochhar and SBI Chairman Arundhati Bhattacharya.\ Ajit Ranade, Chief Economist, Aditya Birla Group, Jahangir Aziz, Chief Economic, JP Morgan and Subir Gokaran of Brookings Institute were among the economists/experts present at the meeting. Others who attended the meeting included industry chambers’ heads — Sumit Mazumder of CII, Jyotsna Suri of FICCI and Rana Kapoor of Assocham. Government officials present the meeting included Finance Secretary Ratan P Watal, Commerce Secretary Rita Teaotia, Economic Affairs Secretary Shaktikanta Das and Chief Economic Advisor Arvind Subramanian as well as Niti Aayog vice chairman Arvind Panagariya.